Ultra-quiet 180-gram vinyl pressed at RTI! In 2018 Intervention is releasing double-LP artist-approved expanded editions of sweet's trilogy of 90's power-pop classics, Girlfriend, Altered Beast and 100% Fun, plus the Son of Altered Beast 7-song EP, which appears on vinyl for the very first time! Each Expanded Edition Double-LP set of the three classic studio albums is loaded with extra tracks not included on the original LPs — six extra tracks each on Girlfriend and Altered Beast, and seven on 100% Fun (see IR website for track listings and other details). So many of these songs are either appearing on vinyl for the very first time or seeing official release for the very first time. And for Sweet completists, these LPs are the most extensive collection of extra tracks compiled and packaged with the studio albums the songs were recorded for! All of the reissued LPs are 100% analog mastered from the original analog master tapes by Ryan K. Smith at Sterling Sound. The original 15-song repertoires for Girlfriend and Altered Beast are for the first time spread across three LPs sides for maximum sound quality and the ability to PLAY LOUD! These ultra-quiet 180-gram LPs are pressed at RTI in Camarillo, Calif. 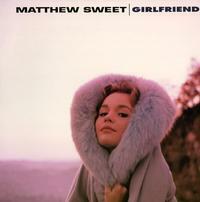 The jacket art for Matthew Sweet 1991-1995 has been faithfully restored by IR's art director Tom Vadakan. The three Expanded Editions feature beautiful "Old Style" gatefolds printed onto heavy blanks and film laminated by the wizards at Stoughton Printing. Son of Altered Beast features a single-pocket "Old Style" gatefold by Stoughton as well. The Girlfriend, Altered Beast and 100% Fun Expanded Editions will also be released as Hybrid SACDs in Super Jewel Boxes.